Morning sunshine streams through the living room window to the dining room. I was caught by the play of light and shadow on the tablecloth there. This past week was full of short, but light-filled days. On Friday afternoon, Tim and I rushed home from work, grabbed our bags and headed for the ferry. When we arrived on the mainland, around 6:30 pm, it was fully dark. A wall of fog blanketed the valley and made driving in the darkness seem darker. About 30 minutes from my parents' house, the fog lifted and the skies cleared. We didn't see anything of the mountains that night, but the next afternoon, driving into Chilliwack, beautiful Mount Cheam overlooked the town, clearly delineated against a cloudless sky. The reason for our visit? My sister's 60th birthday party, planned by her children. It was a fun time to visit with some aunts, uncles, and cousins whom I don't often see, as well as with my parents and siblings. Darlene was a good sport about wearing the tiara for quite some time. The trip was a quick one. We left the party around 5 and headed back to the ferry, without any fog on the road. It was good to get home and sleep in our own bed. Christmas is slowly appearing here: red and white dishes, sprigs of greenery, lights and decorations on the mantels. We purchased our tree, but won't put it into the house until after our party on Friday, to make more room for guests. We're thinking about putting just the lights on it and placing it on the porch outside for a bit of sparkle. How nice to be able to pop over on the boat and visit your family quite easily, once we cross the Channel to UK we have a five hour drive to reach ours. Happily we're meeting in London next month and will have a couple of days there together. Your sister looks very pretty in her sweet tiara and the cupcakes look yummy! Looking forward to hearing how the party goes and seeing more of your lovely home decorated for Christmas. Ah ... you were in our valley and it was sunny and beautiful this past week! I love the idea of the tree waiting on the porch. I'm attracted to the pretty cup cakes! How very pretty your red and white plates look. So nice that you were able to celebrate with your sister and family. Looks like a lovely view of the mountains. Your touches of red and white are so pretty. How nice to be able to celebrate your sister's birthday with her. Love the red and white dishes. Merry Merry and a Ho Ho HO! Happy Monday! That was a quick trip, but a special one! I love that your sister wore the tiara! I'd love to look at that mountain every day! Love your red and white! A whirlwind trip, but so lovely to be able to celebrate a milestone birthday with your sister! Your china shelves capture my fancy! Sounds like you'll have a busy week preparing for a celebration. Enjoy! 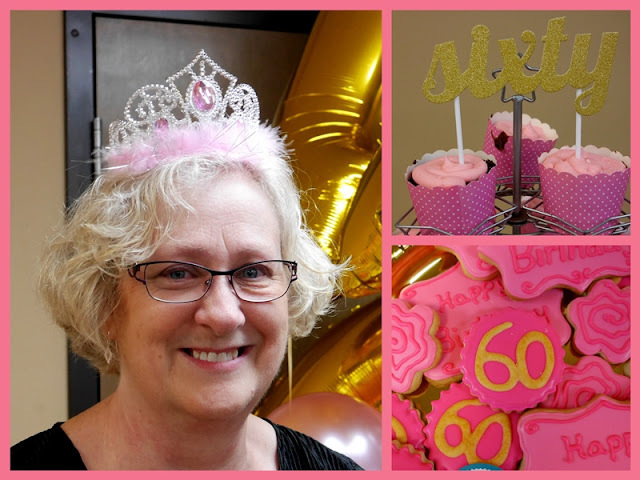 Happy 60th birthday to your sister! I've seen that beautiful Mt Cheam many times on Judy's "My Front Porch" blog! An amazing fact to me is that I found out from Judy the elevation of Mt Cheam and live at the a;most the same elevation, but I am in a valley. Colorado is a very high elevation state, even on the plains. Enjoy your Christmas tree decorating! Happy 60th to your sister! I know she was thrilled to have you there to celebrate. Beautiful photos, Lorrie! Lorrie, Your sister was a great sport. Those with December birthdays sometimes get lost in the Christmas rush. Good to take time for family. I was home last weekend for Dad s 88th. Have a great week and enjoy the tree. Sylvia D.
Happy Birthday to your Sister...she sure looks pretty! Sounds like such fun! Enjoy your party and all the holiday festivities! Holiday hugs! Belated happy birthday to your sis. Looks like she had a memorable celebration of her milestone birthday. How nice you could take the quick trip to celebrate your sister's birthday. The idea for the tree on the porch sounds great! Belated Happy Birthday to your sister! happy birthday to your beautiful sister!! She has such lovely hair!!!! Beautiful photos,,I joined to follow your blog so I keep up with your adventures ! Please wish your lovely sister a very happy 60th birthday year! She looks like a fun person. Love & covet your red dishes!!!! Oh sparkle lights on the porch sounds so welcoming. What a wonderful quick trip for your sisters birthday. I see that you are related in her face. Love that she wore the crown too. What...Darlene celebrated a milestone birthday and I was totally unaware. I had a nice chat with her about a week ago. I will send her belated birthday wishes. Glad you could make it out for her birthday celebrations! We never had the fog that blanketed Vancouver all last week. The clear skies and snow-capped peaks have been such a treat these past two weeks! Happy birthday to Darlene! I think she's beautiful in her tiara. I think the fog sounds ever so lovely, as long as I didn't have to drive in it. Christmas is a'coming and your red dishes are out, so much fun, isn't it? A porch tree sounds delightful, the guests will love seeing it when arriving. Lorrie - did you make the tablecloth in the first picture? It does a fine job of showing off the table underneath while still covering it! The cookies from Darlene's party look delicious - I love frosting! Enjoy your party on Friday! Your sister looks so cute in her fun birthday crown...what a good sport. Happy Birthday to her. Happy 60th birthday to your sister!! How cute she looks in her tiara, Lorrie. Your red (my favorite color) dishes look so pretty in your hutch. Your sis looks adorable in her crown and I know how much it surely meant to her that you were able to help her celebrate that milestone birthday. Love that gorgeous sun-drenched crocheted table cloth and lovely red and white dishes! What fun is that to hop over and share in your sister's special birthday. She looked happy and beautiful. Those cookies looked so yummy. // Your red dishes, along with that bit of green, do add such a touch of the festive in your home. Wishing you a beautiful evening, Lorrie! Your sister is lovely, and how sweet of her to keep the tiara on! It's wonderful that you were able to hop over and spend time with your extended family. Love that crocheted tablecloth - gorgeous! How wonderful to spend this special birthday with your adorable sister! The view of the mountains is stunning. Such a pretty crocheted tablecloth lit by the sun and your red and white dishes make the perfect Christmas display! The gathering for your sister sounds wonderful. So glad you were able to connect with members of your wonderful family.